Ant Man is a popular Marvel superhero with the amazing powers of shrinking. Using his high-tech suit, he shrinks his body down to fight crime and befriend ants. Or at least that is what is commonly believed: the truth is that Ant Man can't shrink at all. For Ant Man to be able to successfully shrink, several things must occur. He must somehow reduce himself to the size of an ant whilst maintaining his entire mass otherwise he would be unable to grow back to normal size without being some horrific stretched-out shell. As a result, an ant-sized Ant Man would weigh as much as a human, exerting an enormous amount of pressure on his tiny feet. This super-dense man would sink automatically in any surface except the hardest diamond. His internal organs would likely collapse as well due to his super-dense body (that is if they haven’t already exploded from being compacted down so much and in so short a time!). How could Ant Man breathe? Oxygen molecules would still be normal sized, and so he would be trying to force through proportionally gigantic molecules of oxygen into lungs and a blood stream that wasn't designed for it. A shrunken Ant Man would die within minutes, if not seconds. So how does he achieve the effect of shrinking? The answer is startlingly obvious. 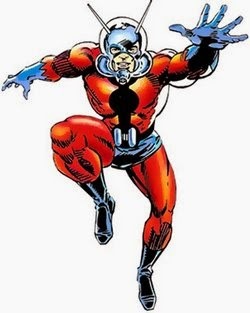 Ant Man's suit does not subject him to shrinking powers. Instead, it shields him from growing powers. The abilities of the suit are not pointed inwards, they are pointed out in the direction of the whole world. When Ant Man triggers his 'shrinking' device, his suit sends out rays that instantly enlarge the planet Earth and everything on it. In this way, Ant Man is able to simulate the ability of being small whilst being able to breathe air and not having to worry about being super-dense. This also explains why he retains his normal strength, as nothing changes for him. Why does the Earth suddenly develop hundreds of superheroes in the early 21st century? It is because of Ant Man. His constant use of his powers, causing everyone and everything to grow to enormous sizes and then back again, has caused genetic mutations in the general populace and helped the superhero gene to rise.